Get ready to party with Share! October 2018. Share Annual Awards. Fundraising. Job coaching grant. Wellbeing work. Mansoor. New season garden planters. Christmas wreaths. Carer survey. Jobs at Share. Healthy recipes from Share. 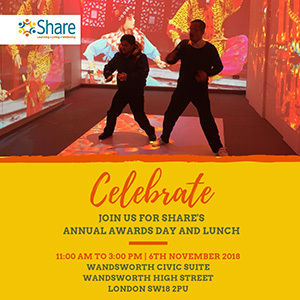 Share's Annual Awards Day and Lunch is nearly upon us. And this year we're celebrating our accreditation as a Centre of Excellence for Autism by the National Autistic Society. The event takes place on Tuesday 6th November 2018, from 11am to 3pm. And your're invited! Join us and help us to celebrate Share's year of 2018. The event is a showcase of all that is Share – highlighting what we do, how we do it and a look at our hopes for the future. 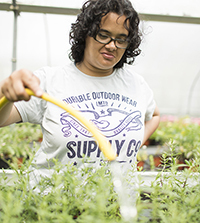 Join us and see for yourself how we are making a difference in the lives of disabled adults in our community, helping them to become more independent and supporting them to live happier, healthier lives and realise their full potential. To find out more, visit Share's website or contact Kavita Bowry via email kavitab@sharecommunity.org.uk or telephone 020 7801 9821. Thank you to everyone who supported Share's Fundraising Pub Quiz in September. What a fun evening! 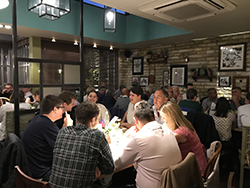 We welcomed over 100 people to the Castle Pub in Tooting and the event helped to raise awareness of Share's work in the community as well as valuable funds to support our work. Every penny counts at Share, so thank you to everyone who turned out and brought friends and family, and everyone who donated prizes for our raffle. Share has received a grant of £5000 from Peter Stebbings Memorial Charity towards its job coaching work with Share students. 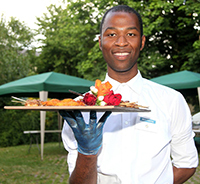 To find out more about Share's employment support programme, contact Share's Job Coach, Claire Smith, via email claires@sharecommunity.org.uk or telephone 020 7801 9823. 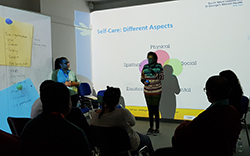 Our students have started a short course on wellbeing with Talk Wandsworth as part of a nationwide effort to promote the accessibility of talking therapies. 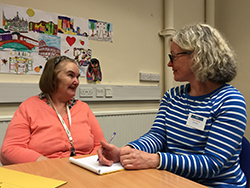 To find out more about Share's wellbeing work, contact Karen Miles, Share's Wellbeing and Outreach Manager, via email karenm@sharecommunity.org.uk or telephone 020 7801 9812. Meet Mansoor, a studious, gentle young man, with a passion for sport. Find out how he's grown in confidence during his time at Share – gaining qualifications in Basic Skills and Digital Skills, getting healthy with Share's Healthy Living project, and going out and about with Go Anywhere, Do Anything. Share students have been busy creating planters and hanging baskets for the new season. 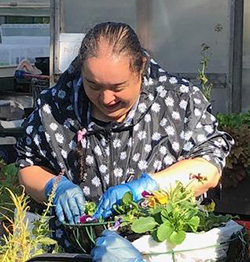 Visit Share Nurseries, Share's gardening social enterprise, based in the grounds of Springfield University Hospital in Tooting, to get a little something to brighten up your green space this winter. Share Nurseries is open Monday to Friday, from 9am to 3pm. For more information, contact Sarah Bailes via email sarahb@sharecommunity.org.uk or telephone 020 3513 6460 or 020 7924 2949. 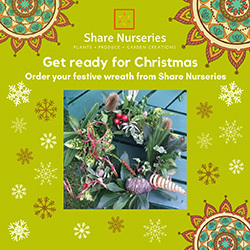 Share Nurseries, Share's gardening social enterprise, is now taking orders for its handmade Christmas wreaths. All part of our students work making garden creations, our Christmas wreath project is a vital part of our social enterprise work, providing safe and supported real-life work experience, and embedding key employability skills such as quality control and customer service. To order your special Christmas wreath, contact Sarah Bailes via email sarahb@sharecommunity.org.uk or telephone 020 3513 6460 or 020 7924 2949. 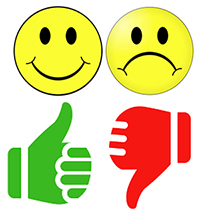 We value the opinions of all our stakeholders and carry out various surveys throughout the year to solicit everyone's views on how to make Share simply the best! We are currently carrying out our Carers' Survey so you can tell us what we're doing right, what we're not and what we can do better. As a thank you for completing the survey in full, we will enter you into a prize draw to win a £30 gift voucher. You can fill out the survey online or if you would like a hard copy to be sent to you, please contact Leanne Wood, Share's People and Projects Manager, via email leannew@sharecommunity.org.uk or telephone 020 7801 9825. Visit our website to find out more about our work or contact Leanne Wood, Share's People and Projects Manager, via email leannew@sharecommunity.org.uk or telephone 020 7801 9825 for more details. 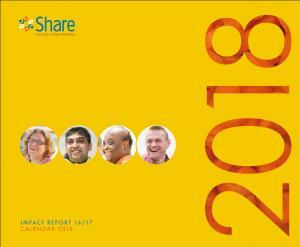 Have you tried any of the recipes featured in Share's Impact Report for 2016/17?